This is my first book tour participation and in the true spirit of "last but not least" I'm pretty excited to be closing Abigail's two week book tour organised by Bewitching Books; Thanks to you both for including me. Ollie Dormier's tattoos are deadly. She is a Scrivener-an employee for Death-and her skull tattoos mark her clients for their demise. She does her job, and she stays out of trouble. But when her hands start to burn hot and fierce, and her control goes leaping out the window, all hell breaks loose. Ollie is showing the early signs of being a Master...demonstrating power that is forbidden. That power is exactly what Reaper Brent Hume is counting on. A hot, scruffy rebel, who does marvellous and terrifying things to Ollie's insides. Now he needs Ollie's help-and her skills-to overthrow the evil and corrupt Head Reaper. That is, if he can figure out a way to keep this hot-handed girl cool...and keep his hands off. There was something about this book that felt original and fresh. Abigail is an excellent storyteller. However whilst I really enjoyed this book it took a while to warm up and pull me in but once hooked it was hard to put down. In a troubled world Ollie has a gift and together with rebel Brent a chance to restore 'balance'. There are some who help and others who try to stop them. When one thing leads to another a hot and unlikely romance develops with rebel reaper Brent. I enjoyed the way the characters and her gift (which originally felt more like curse) developed as the story progressed. Her "hands burning hot with fury" may seem like a strange gift but is well both integrated into and key to the story. The story itself is very engaging and well told mixing first person narrative with chatty prose. The characters are interesting and well developed. I liked Ollie she was easy to relate to and despite her calling had a really human side. I liked Brent the reaper too which surprised me. Dudley her dog was a nice touch and an excellent contrast to the dark forces at hand. The "marvellous and terrifying things" Brent does to Ollie's insides feel original and add spice. The book whilst obviously a paranormal romance is also about people and the importance of family, friends and relationships. In particular when faced with difficult choices the importance of overcoming your fears and stepping up to protect not only your own interests, family and friends but those of the plebs too. 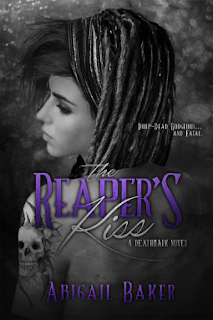 The quality of the writing is good which is no surprise Abigail having won first place in RWA’s Golden Network’s 2011 Golden Pen in Paranormal Romance for TATTOO OF YOUR NAME ACROSS MY SOUL now published as The Reaper's Kiss. The book has lots offer in both in terms of plot and hot romance. The first of a series; I liked the ending which fitted the story well and left plenty of scope for the next book which is planned for release in June 2016. In reflection I loved this book which is very different and far removed from most of the fiction I have read recently. The decision to read this book was pure impulse having spotted it by chance online. There was something about the combination of deadly tattoos and the grim reaper which attracted me and reminded me of the many hours spent watching SyFi Channel with my children. Bookaholics Not-So-Anonymous: "This was a breath of fresh air in a genre that's often thought of as only being about ghosts, vampires, werewolves, and angels." Live Laugh & love Books: "...sometimes I felt that I was sitting at the edge of my seat wondering what was going to happen next." Boundless Books: "One of the best books I've read this year, in this genre." and a $15 Amazon or B&N gift card (winner’s choice). Open to US Shipping only.